Rep. Mark Meadows (R-N.C.) floated a compromise solution on Jan. 15 to end the nearly monthlong partial government shutdown sparked by an impasse over funding for a barrier wall on the U.S. southern border. 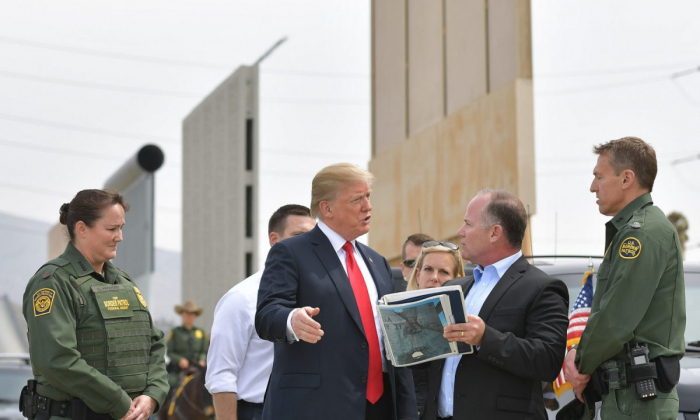 President Donald Trump is insisting that any new funding bills include $5 billion for the wall. But House Speaker Nancy Pelosi (D-Calif.), has called a border wall both “immoral” and “a waste of money”; other top Trump critics have followed suit. The idea proposed by Meadows, however, would allocate money clawed back from government overpayments or payments made in error to fund the border wall—a potentially massive source of funding. “Every year, the U.S. government pays billions of dollars to people in error. Possible compromise: an amendment allowing recovered money to be spent on border barriers. It wouldn’t appropriate even ONE new dollar, allowing Democrats to keep their promises while securing our borders,” Meadows wrote on Twitter. Meadows didn’t immediately respond to a request for comment. But the issue of government waste was recently explored by the Government Accountability Office, an investigation agency of Congress. Improper payments are defined as payments that shouldn’t have been made or were made in incorrect amounts under statutory, contractual, administrative, or other legally applicable requirements. “Fundamentally, every taxpayer dollar should be treated as sacred, and the issue of improper payments is among the most outrageous for taxpayers,” Kalin said in an email. The proposed border wall, like anything else, requires a fiscally responsible approach, he said. “In terms of border security, any policy proposal should be approached with the singular goal of solving the problem in the most practical, measurable, and cost-effective way possible, just like any other government program,” Kalin said. Kalin explained that agencies typically measure improper payments after they have been already made, while doing little before taxpayer resources are spent. “Not only are hundreds of billions being wasted, too many programs shirk the responsibility of checking whether a payment is improper,” he said. Under the Improper Payments Act of 2002, federal agencies are required to perform risk assessments to identify programs that may be susceptible to significant improper payments. In its most recent report, published Jan. 10, the GAO reviewed a sample of five programs across four large governments agencies: the U.S. Treasury’s Interest on the Public Debt and Home Affordable Modification Program, the Department of Justice’s Law Enforcement program, Health and Human Services’ Head Start childhood development program, and the Department of Agriculture’s Risk Coverage and Price Loss Coverage program. Auditors selected these items because their total outlays in fiscal year 2017 amounted to $330 billion, and the respective agencies recently produced their own improper payment risk assessments of them. In every case, the agencies said their programs weren’t at risk of significant improper payments. However, GAO investigators found only one agency, the USDA, could provide the required documentation to support its low-risk claim. While analyzing Department of Health and Human Services records, auditors made a surprising discovery: “Based on the analysis of HHS information, GAO identified at least 140 programs or activities that were not assessed during the three-year period,” of 2015 through 2017, as required by law. Auditors commended the Department of Agriculture (USDA) for providing sufficient documentation to support its low-risk self-assessment of its audited program. But the USDA grappled with a major improper payment scandal during the same 2015-17 period regarding its largest program, the Supplemental Nutrition Assistance Program (SNAP), or food stamps. Every year, the USDA’s Food and Nutrition Service (FNS) issues a national error rate for the $60 billion to $70 billion food stamp program. The national error rate, which measures improper overpayments to food stamp recipients, is based on the individual errors rates of all 50 states and six U.S. territories. After reporting improbably low error rates during the Obama-era escalation of the program, the agency’s inspector general found that many states were reporting fabricated figures to which the USDA didn’t effectively question, but instead issued millions of dollars in low payment error bonuses, according to the Government Accountability Institute (GIA), a nonprofit journalism organization. “The reason for the breakdown in error rate integrity was that FNS created faulty incentives for states already in need of funding, and states took advantage of lax program rules to obtain funding bonuses,” a 2018 GAI report says. In fiscal year 2015, the USDA only included 10 states in its national error rate. The next year, it failed to report any improper overpayment figures. In FY 2017, the USDA produced a roughly 5.2 percent overpayment rate, equivalent to $3.3 billion of the $63.6 billion program—or more than half of the requested southern border-wall funding. According to PaymentAccuracy.gov, there are many factors causing improper payments across government agencies, including poor program design, an inability to authenticate a recipient or contractor’s eligibility, and the failure to identify key data, such as whether individual recipients are in prison or dead.